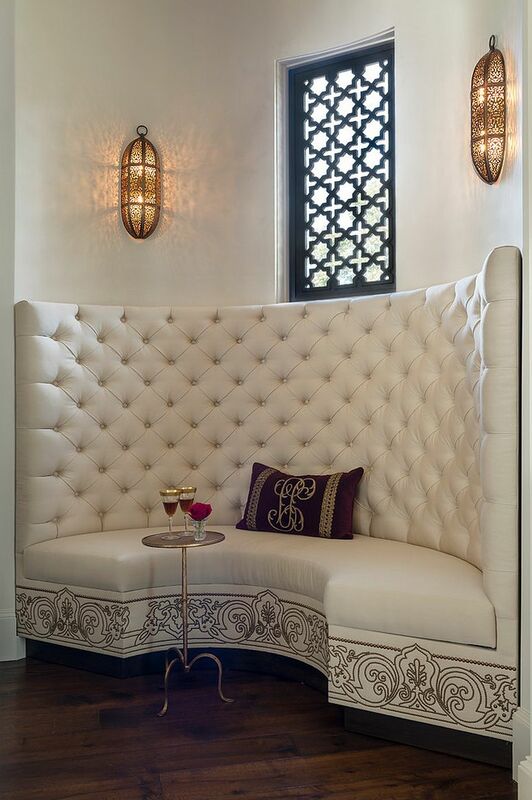 If there is one style that is a wonderful amalgamation of varied cultures, traditions, nuances and diverse backdrops, then it is surely Moroccan. 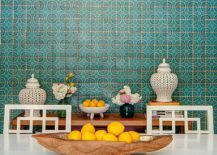 A constant influx of ever-changing Asian, European, Middle Eastern and, of course, African influences has turned Morocco into a cultural crucible of sorts where all of these drastically different elements intermingle and coexist in a seamless fashion. 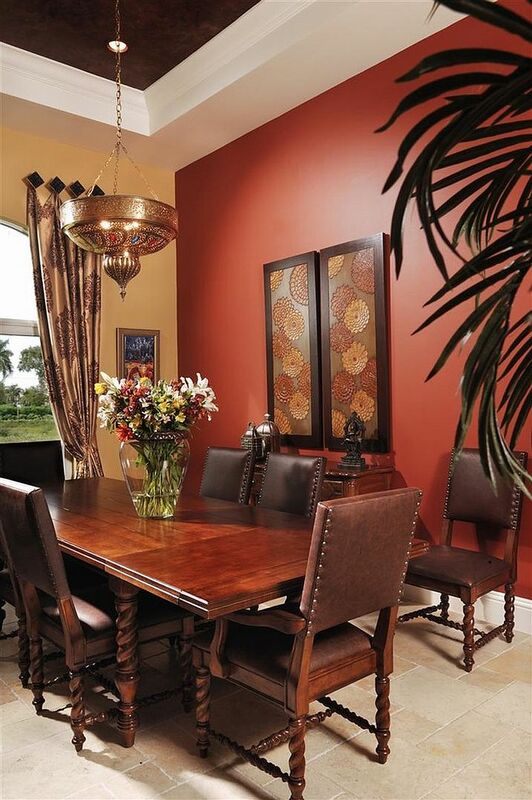 Carrying with it an air of exotic opulence, timeless beauty and the magic of the Saharan landscape, this is a decorating style that is perfect for the unique and exquisite dining room. 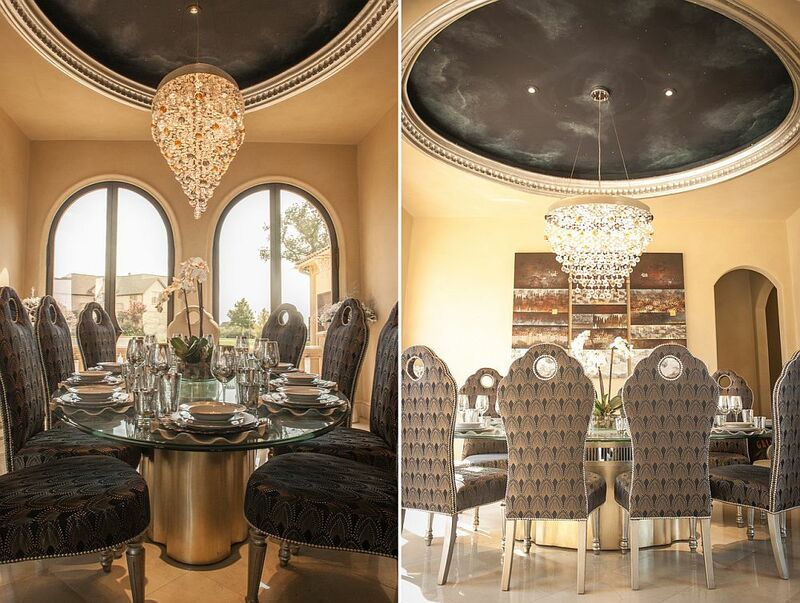 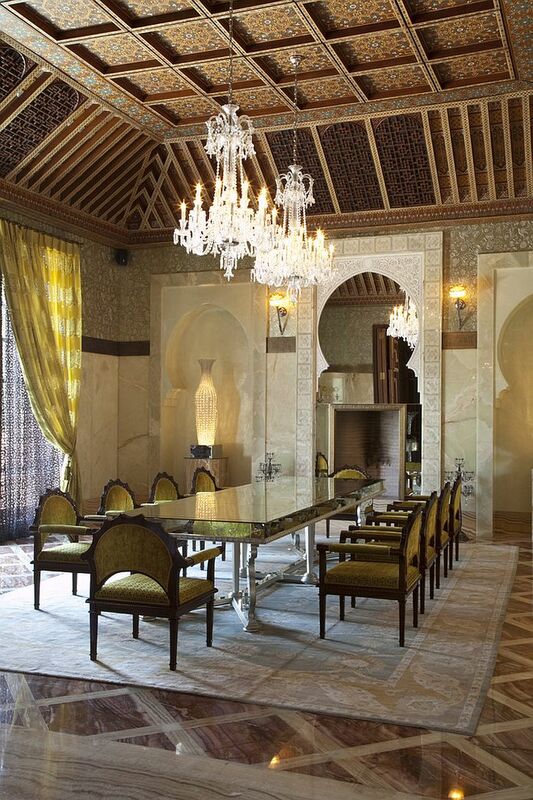 A Moroccan dining room means different things for different people. 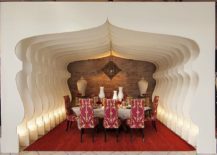 Some might like the informal and colorful setting inspired by a Bedouin tent, while others might want to replicate the glitz, glamour and grandeur of the palatial homes in the region. 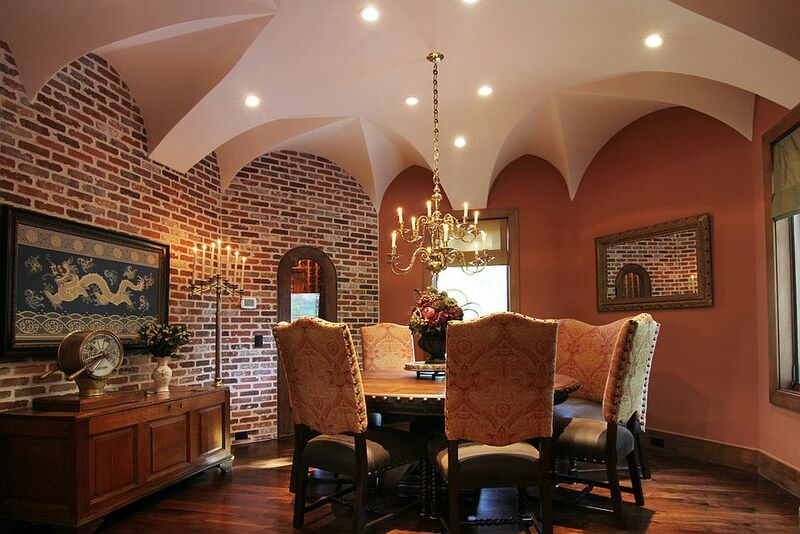 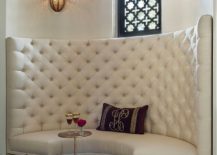 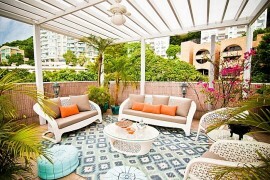 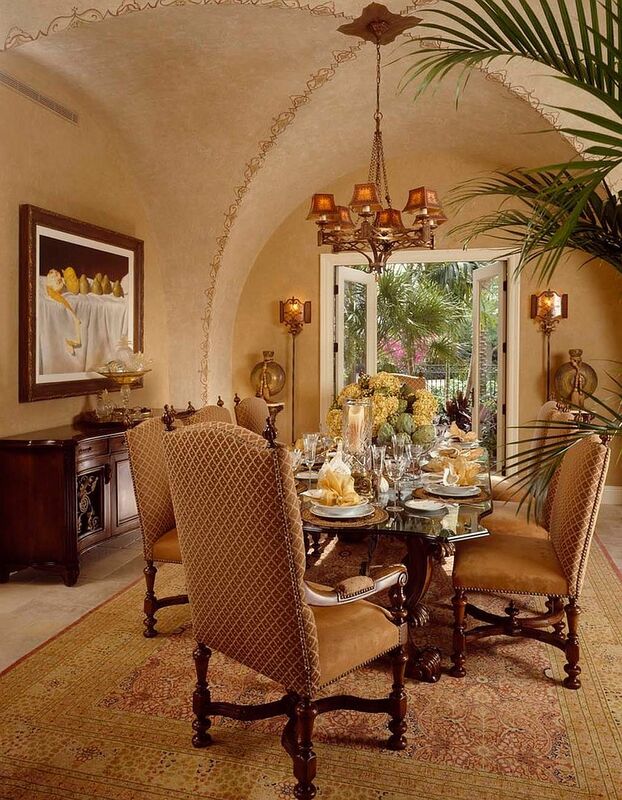 Others could prefer a room with Moroccan-Tuscan style that borrows heavily from Spanish design. 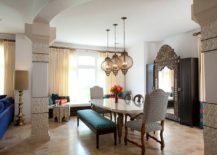 Irrespective of what your personal preference is, here are 16 dining rooms that usher in a dash of Moroccan magic in their own inimitable fashion! 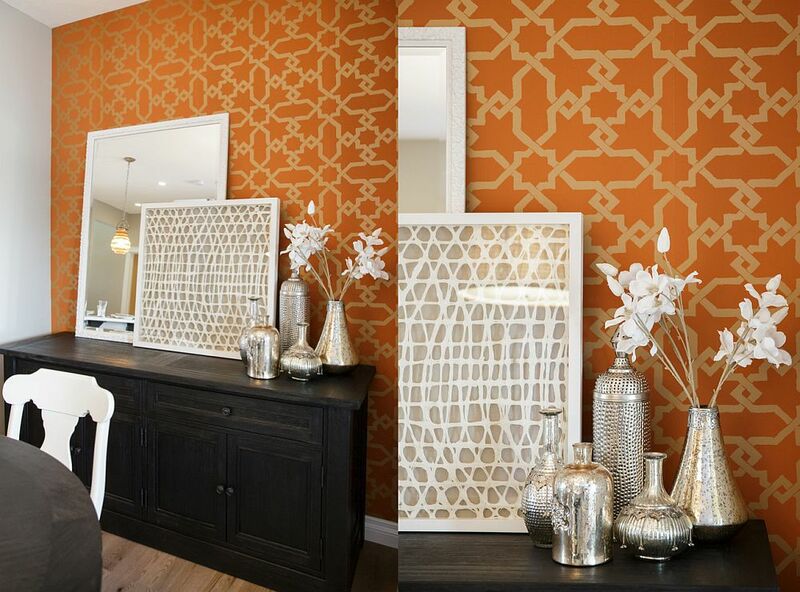 Traditional Moroccan design is full of color and pattern, and adding these to the dining room definitely gives it a quick and vibrant makeover. 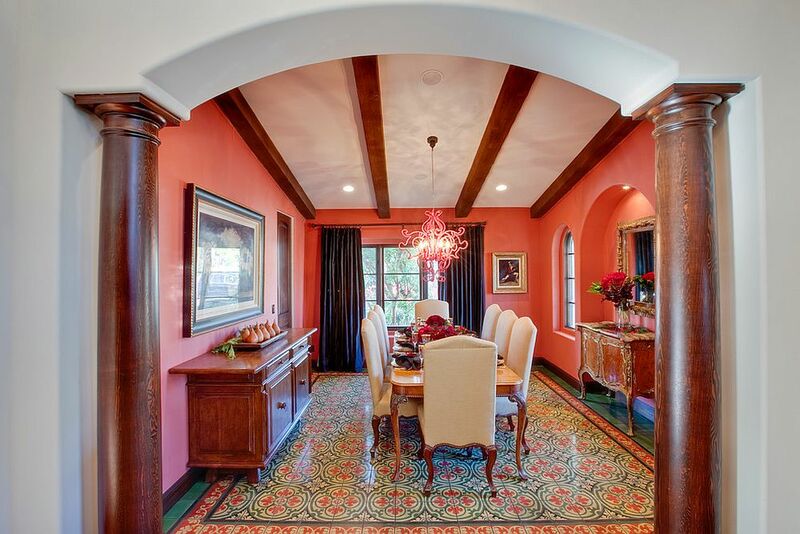 Archways, ornate windows and the striking Islamic keyhole design can create a smart entry to the dining room and also shape its windows and other architectural features, while bright and iconic Moroccan rugs can set the template for an unforgettable dining space. 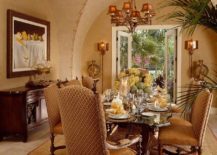 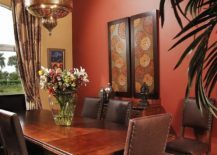 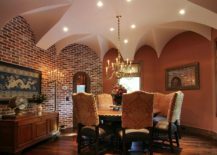 Warm, earthen hues and textured walls are another staple of the style, and if you want a dining room that looks truly Moroccan all the way, they are an absolute must. 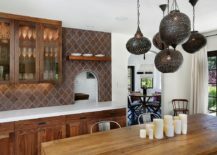 You need not go all the way with Moroccan style and can add a touch of its endearing charm to your existing dining room by simply making clever, subtle changes. 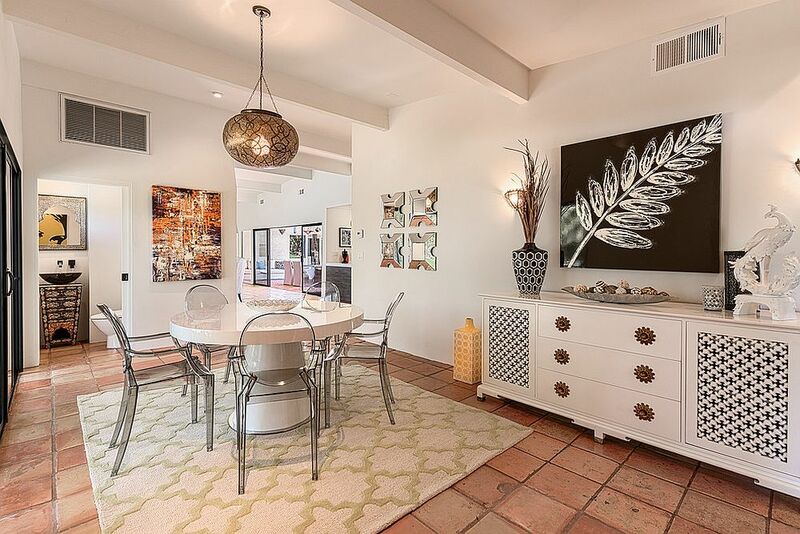 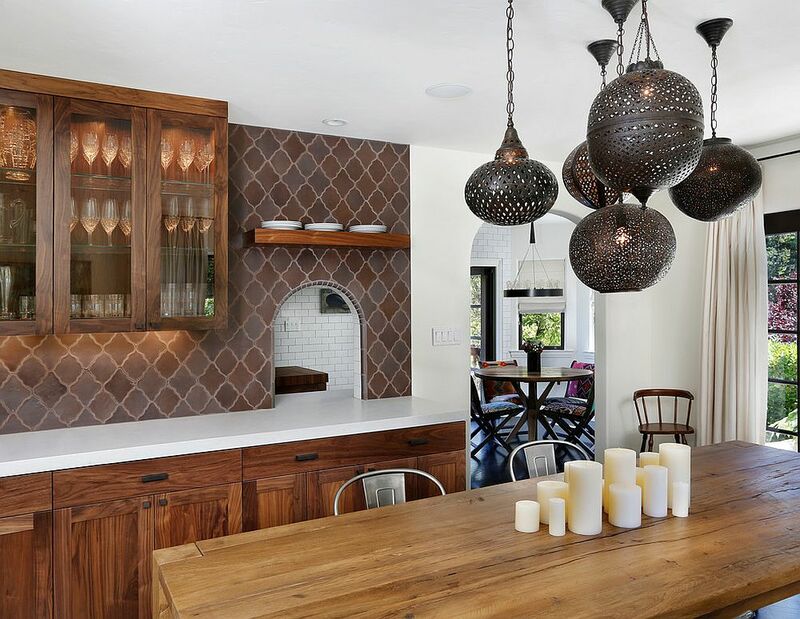 Moroccan lanterns are the perfect way to get this done without actually splurging on a complete dining room revamp, and these glittering lamps can instantly bring in a relaxing Mediterranean vibe without ever altering the existing style of the dining space. 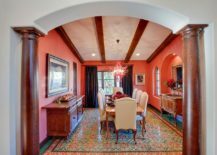 Shabby chic, bohemian and Spanish colonial styles combine with Moroccan touches with ease, while a room divider with an indigenous pattern and colorful tiles can give modern and contemporary dining rooms a Moroccan zest! 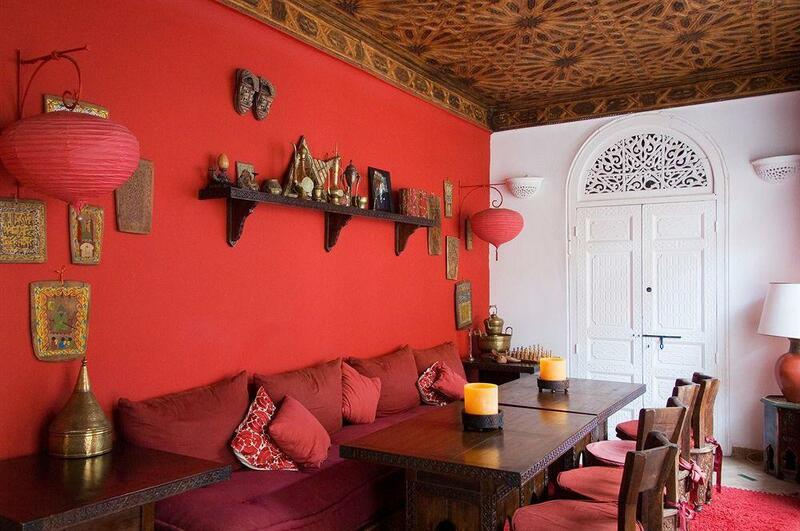 Carved and ornate wooden sideboards, plush and bright-colored cushions and seat covers, and walls draped in hot red, mellow orange and lovely yellow; the Moroccan dining room allows you to express yourself in an unabashed fashion! 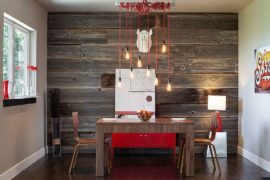 If the contemporary dining room with a muted gray backdrop always felt far too boring, then try out this outlandish style this spring and you will surely fall in love with it. 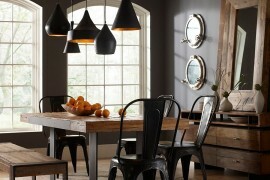 Wooden dining tables with a traditional bend and matching chairs feel apt in such settings, but mid-century icons like the Tulip table also work surprisingly well. 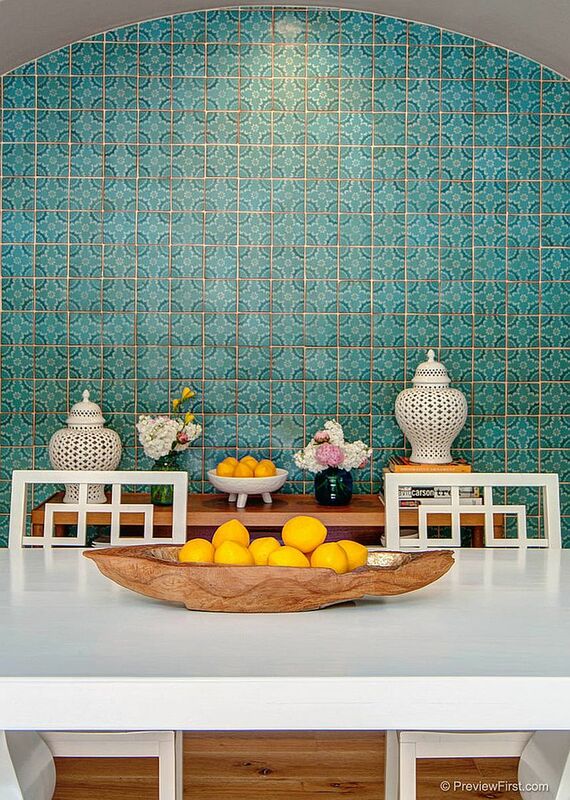 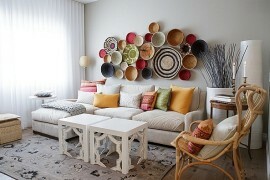 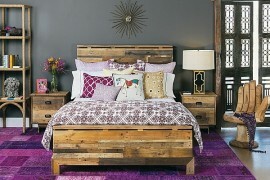 Want to try out this gorgeous style in other rooms as well? 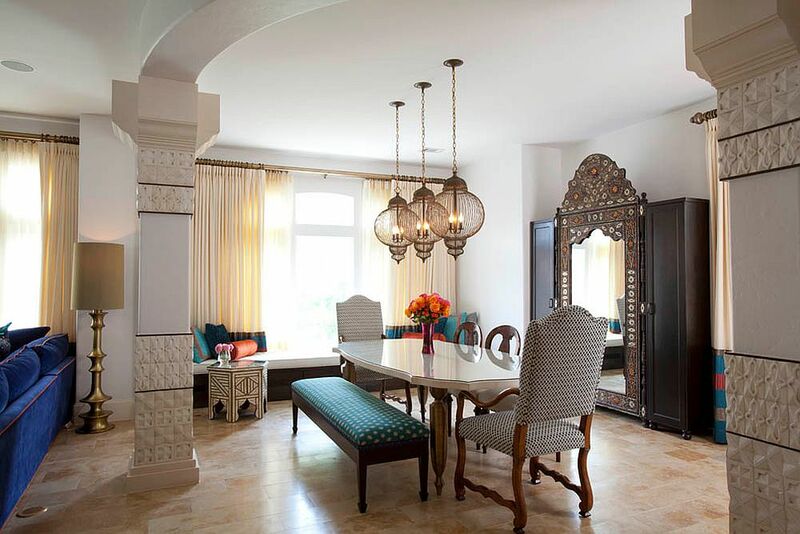 Here are 33 living rooms and bedrooms with Moroccan style for more inspiration!